From blossom to pasty…the life of one apple. It all started months ago with a bud. Spring was late in coming this year. But when it finally did arrive, the fruit trees were covered with buds. In the spring sunshine, our pink bud unfurled to form a pale flower. The weather stayed mild, there was no frost damage and the blossom did its job of attracting pollinators. All those flowers were much appreciated by the bees. 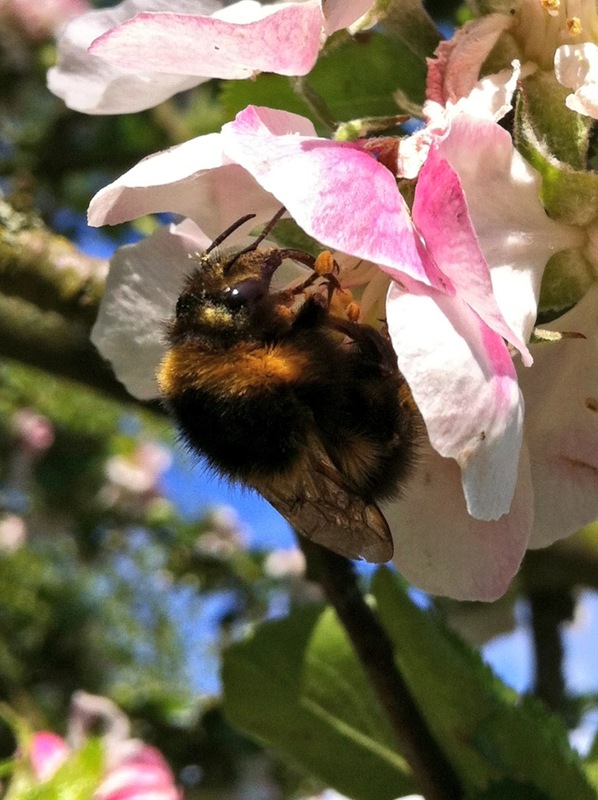 Bumblebees were buzzing among the apple blossom until late in the evening, and the solitary bees found plenty of nectar and pollen to provision their nests. 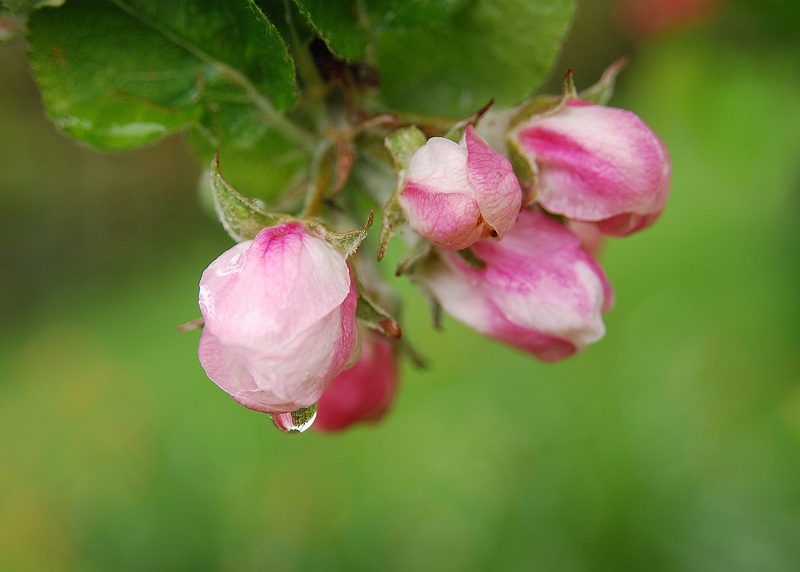 After the bees had visited the flower, the petals fell away to leave a tiny baby apple. All through the long, warm and not too dry summer, the apple grew slowly and steadily. And as summer’s end approached it became speckled with red on the side that faced the sun for most of the day. The tree that this apple grew produces late fruit. 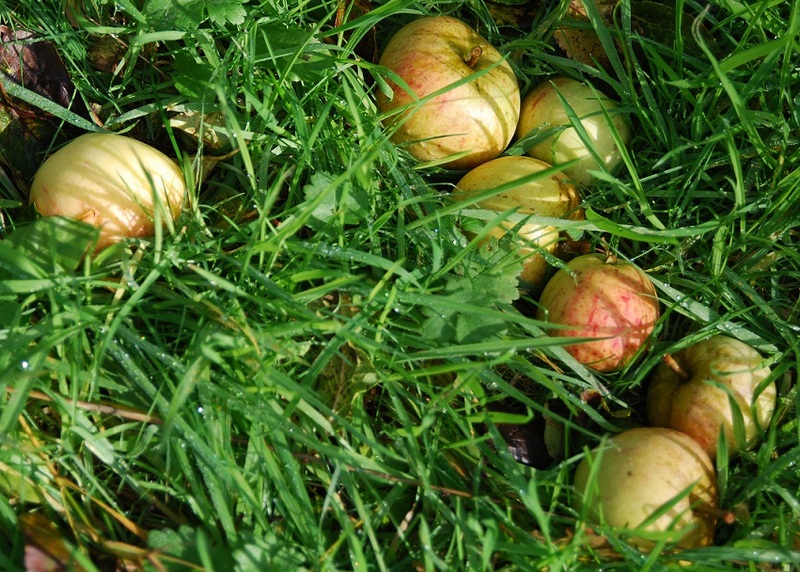 There are still apples on the tree now, although there are plenty littering the grass below it too. Today our apple was carefully picked from the tree and brought up to the kitchen to form the basis of a filling for homemade pasties. Mixed with onion, sage and smoked cheese and wrapped in crisp, golden pastry the apple has completed its journey from spring blossom to an autumn tea. The pasties would also make perfect additions to a lunchbox – although if I was making them for my daughter the smoked cheese would have to go… Wensleydale would be an acceptable alternative. 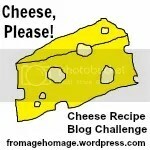 Whichever cheese goes into the mix, I’m linking this post to this month’s Family Foodies challenge. It’s Vanesther’s turn to host in November, taking over from Louisa who kicked the new challenge off last month. If you’re looking for ideas to add variety to those school lunchboxes, this would be a good place to start. Make the pastry, wrap it and leave it to chill in the fridge while you make the filling. Heat the oil in a small frying pan and cook the onion over a medium heat for about 5 minutes. The onion should be softened and starting to become translucent, but not browned. Add the celery and cook for a few minutes more. Stir in the freshly grated nutmeg and the sage leaves, and leave the mixture to cook while you core the apple and chop it into smallish chunks. Once the apple is ready, add it to the pan, stir and leave to cook for another 5 minutes. When the apple is starting to warm and soften, take the pan off the heat and add the grated cheese. Stir to combine, then check the mixture for seasoning, adding salt and pepper to taste. Preheat the oven to 190oC, 375oF, gas 5. Grease a large baking sheet. Roll the chilled pastry out on a lightly floured board until it’s a little over ½ cm (¼”) thick. Cut out six circles of pastry about 15 cm (6”) in diameter (I cut around a saucer to get a neat circle). Put three or four spoonfuls of the filling mixture onto one half of each circle. Brush the edge of the pastry with beaten egg, fold the side without filling over the top and seal the edges by pressing gently. Use a fork to prick small holes in the top of each pasty and brush more beaten egg over the top. Put each pasty on the prepared baking sheet and bake in a preheated oven for about 20 minutes – the pasties will be a lovely light golden brown when they are ready. Eat warm from the oven, or leave to cool for lunchboxes and picnics. Thanks Louisa! Cheese pasties are always good for a picnic or lunchbox – and there are so many different cheese/vegetable (or fruit) combinations to try. What a lovely pictorial story of your apple and the pasties sound yum! I love the way that the apple trees mark the seasons – the next stage will be the bare branches in winter… maybe not quite so photogenic, but a reminder to get out there and do some pruning. A lovely photo-essay of the rich life-cycle of our world. We are so blessed & I thank you for recording it to remind us. I might even grate some cheese in the crust if I make an apple pasty from your recipe. Thank you! Great idea – some cheese in the pastry would add even more flavour! To be honest, I wouldn’t have thought of using a smoked cheese with the apple if it wasn’t for Cheese, Please! Now I’m wondering what else I can use it in! These look just gorgeous – and apple, sage and cheese is a fantastic combination. I actually made something for the lunchboxes today with this same trio, but not pasties. You’ll have to wait until they make it on to the blog later this month. 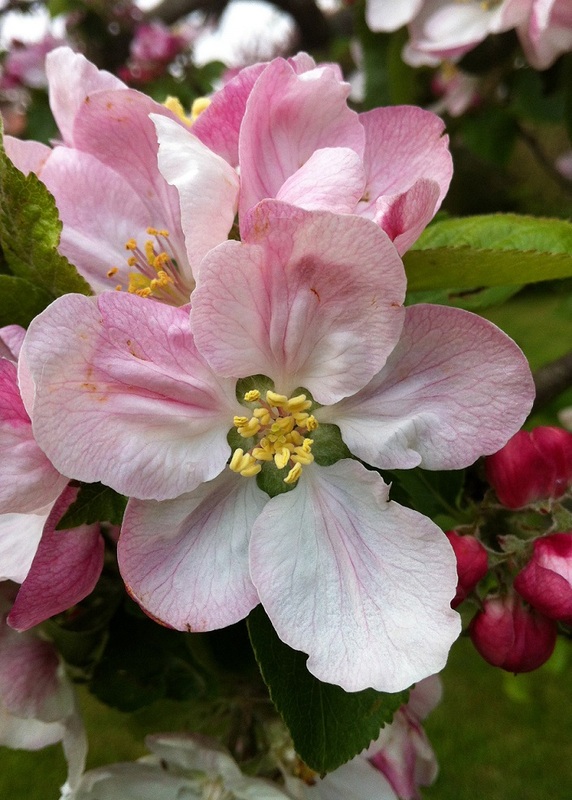 And I love the story of the apple from blossom to pasty filling, plus your photos are just as beautiful as ever. A perfect entry for November’s #FamilyFoodies – thank you. Thanks Vanesther! Now I’m curious about your apple and cheese recipe… I’ll be looking out for your blog post. Beautifully told tale! Never heard of these pasties but will give them a shot, sounds great. Pasties make great picnic food – they have a long history in Cornwall, where they were made to be taken for lunch by miners and farmers because they are a portable meal. Quite familiar and fond of the good old Cornish Pastie but the use of apple, spices and cheese is a new concept. Closest I have tried is an apple turnover! The combination of apple and smoked cheese sounds very good! If only my picky eater would try cheese and fruit together! LOL! Love the story and the photos of the apple. The ending was a happy one, I think! Picky eaters are just impossible aren’t they! Fruit and cheese is such a great combination, it’s a shame to miss out on it. Thanks Claire! If only you lived closer… there are still plenty of apples on the tree that you could have helped yourself to. I reckon all ideas must pick up inspiration from somewhere or other – whether it’s consciously or not. I’m looking forward to seeing your quince recipe! doesn’t it seem ages since those apple blossom days? 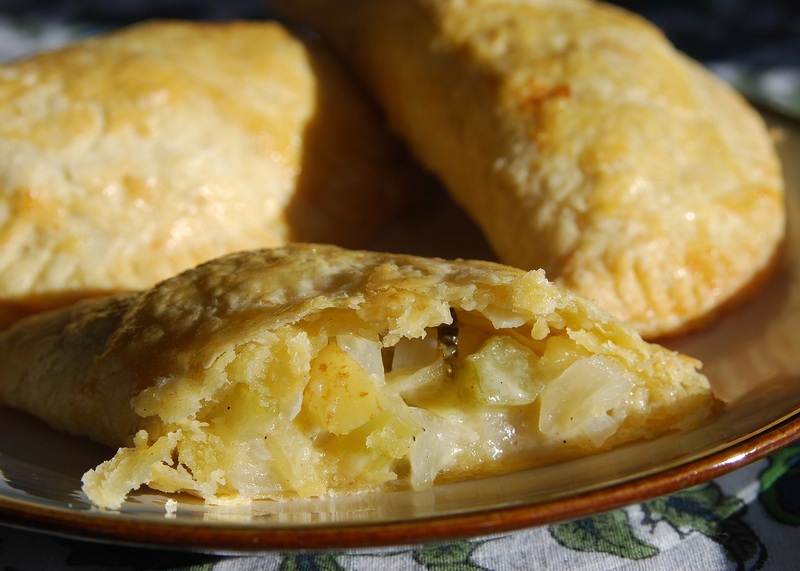 Your pasties sound delicious – just the thing to wrap up and eat warm on a long walk. Absolutely ages since those warm spring days – it’s been a good year for apples, and most other things in the garden… can only hope next year is just as good! Hope you like the pasties if you make them. Smoked gruyere sounds good – I haven’t come across that here, but maybe I just haven’t been paying attention at the cheese counter. Ooh, mmm, I would really like one of those. Right now. It was a lovely year for apples. So much beautiful pink blossom. Let’s hope next year is as good. It’s been the best year for fruit in ages – from the summer strawberries right through to pears and apples in the autumn… long, cold winters don’t seem quite so bad when we get a ‘proper’ summer to follow! Thanks Lisa – you’re very kind! Do you grow apples in Sydney, or do they prefer the climate further south? Totally agree with the others, lovely story with beautiful pictures and I love the idea of combining smoked cheese and apple in a pasty. Setting off on an Autumn with one of these warm to munch on would be wonderful. Thanks Andrea! Unfortunately, but not unexpectedly, my daughter didn’t appreciate the smoked cheese and apple combination… the smoked cheese part of it anyway. She’s set me a challenge of making the pasties with a cheese she would like! 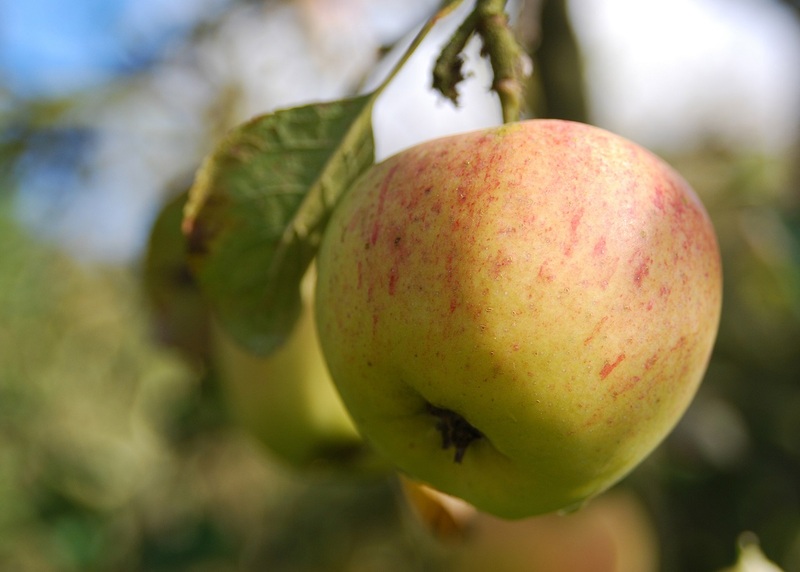 Thanks Karen – with all your apple trees, you must be an expert on apple recipes! ooh these look amazing, what a great combo of flavours. Thanks Helen! Cheese and fruit do work well together.